Peyton Manning’s return to the NFL has not exactly been a fairy tale. His team sits at 3-3, they’ve routinely fallen behind early in games, they average a paltry 93.8 rushing yards per game, and Manning’s top receiving targets include young but inconsistent players like Demaryius Thomas and the ageless but hardly explosive Brandon Stokley. It’s not just those around Manning who have come in for criticism. Manning is still recovering from his neck injury, and there have been whispers &#8212 some quieter than others — that his arm strength isn’t, and will never be, what it once was. Maybe so. Yet, for those still craving some of that old Manning magic, those moments when Peyton shows us all what quarterbacking is all about, Monday was proof that the 36-year-old can still deliver. Following a mistake-filled first half, Manning’s Broncos outscored the San Diego Chargers 35-0 (though not without the help of a bevy of San Diego turnovers) in the second. 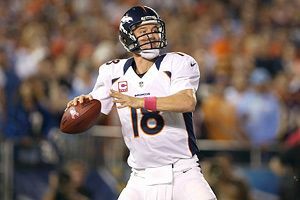 It was vintage Manning — simple audibles at the line, precision throws to a variety of receivers, and, yes, even a few passes where he showed off some of that missing arm strength. All three of Manning’s second-half touchdowns — including the bubble-screen toss to Eric Decker and the go-ahead throw to Stokley on a wheel route up the sideline — were impressive, but the classic Manning play was his touchdown pass to Thomas early in the third quarter. The Broncos lined up with three wide receivers, one tight end, and one running back, with two eligible receivers to each side — one of the most common personnel groupings and formations in the NFL. The play was a familiar one for Manning, which is revealing of the Broncos’ approach. At times this season it’s been clear that Denver head coach John Fox and offensive coordinator Mike McCoy have been more focused on fitting Manning into their offense, with mixed results. Some of this has been because of Manning’s need to learn Denver’s terminology, while the rest of it has just been finding the right blend for the entire team. What we saw in the second half is something we’ve seen all year, namely the Broncos dipping into Manning’s old Colts playbook for plays he’s most comfortable with, and then succeeding with them. The latest example was this play, known as an anchor pass concept: An inside receiver runs a curl or other inside-breaking route right in front of the safety, while an outside receiver runs a post route right behind him. With the Colts, Manning frequently hit Marvin Harrison or Reggie Wayne running free behind someone like Dallas Clark; this time, Demaryius Thomas was the beneficiary. As tight end Joel Dreessen released off the line, he ran straight at strong safety Atari Bigby, who sits and waits for the big tight end, hoping to jump an inside throw by Manning. Meanwhile, the other safety sits on the far hash and watches Eric Decker as he works upfield. 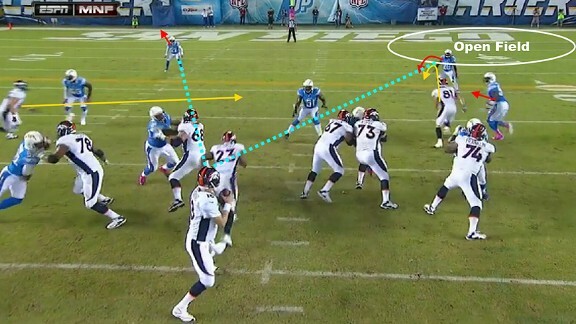 The result — something Manning can clearly see — is a lot of open space behind Bigby for Demaryius Thomas to work. Thomas runs a post route — a route up the field that then breaks to the inside toward, you guessed it, the goal posts — but it’s not just any post. 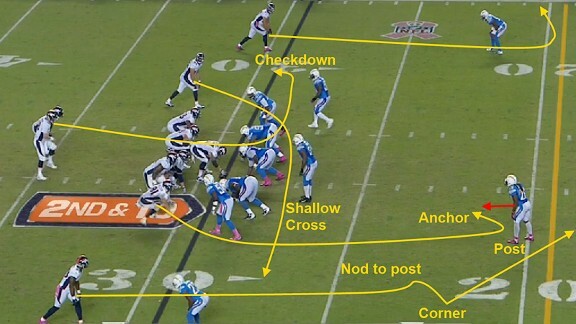 He actually runs a post-corner-post, a subtle ballet of a route that incorporates a weave movement in which the receiver sets up his defender so he can beat him back to the inside. The theory behind the route is something akin to the old Mighty Ducks “triple deke”: Because of time constraints, most pass routes either have the receiver make a swift break or, at most, fake one way and then break the other. On this route, Thomas actually nods to the inside and then breaks outside, which causes the defensive back — here, Quentin Jammer — to essentially think “surely he’s running to the outside,” only for Thomas to then break inside. With Bigby and the other safety out of the picture, that leaves lots of room for Thomas to roam. 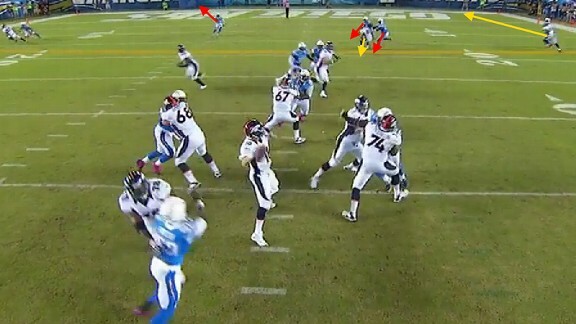 Of course, Manning hits Thomas in stride between the defenders. Obviously, as Manning lamented after the game, it’d be a lot better if the Broncos played more like they did in the second half against the Chargers than they did in the first. There is no way Denver — and Manning — can play so inconsistently for the rest of the year and still expect success. Time will tell which of last Monday’s halves was closer to reality, but for one of them, on Monday Night Football no less, we got some of that sweet, old-time Manning again. Be sure to savor it now; I know I’ll miss it once it’s gone.